I love the Cleveland Museum of Art. If you love art museums and find yourself in Cleveland, Ohio you need to put its art museum on your itinerary. It is one of the best art museums in the country and, except for special exhibits, it is always free. 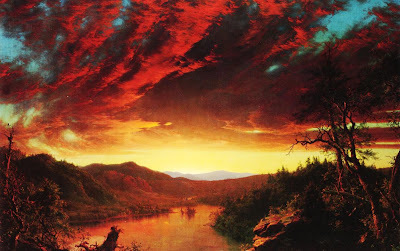 One of my favorite paintings can be found in Cleveland's art museum-- Frederic Church's, "Twilight in the Wilderness" (pictured above). Church painted this masterpiece depicting twilight in the American West in 1860. What Church meant to portray in this painting was known only to Church, but that has not stopped the painting's admirers from speculating as to what the artist wanted to communicate. Some see in the painting an optimistic view of America's future with the so-called "westward expansion," and even though it is twilight, it signifies that a better day is dawning. Others see exactly the opposite. In 1860, Civil War was only a year away; and even though no one was sure at that time that war would be the result over the issue of slavery that no one in the country could any longer ignore, many were seeing ominous signs on the horizon. Perhaps, therefore, Church was emphasizing the twilight-- that a darkness was about to envelop the United States with the bright colors of the sky highlighting the good days that were about to pass from the scene. Whatever Church was trying to portray and no matter what others may see in this magnificent painting, one thing is clear-- those who perceive are just as significant as the one who paints what is perceived, just as those who interpret written texts are just as important as the one who wrote the text. It is impossible to divorce the interpreter from the interpreter's own context in order to render an "objective" interpretation. That is not to say that the "original" context of what was painted or written is unimportant. Nor is the intention of the artist or the author insignificant, and though such intention may be quite difficult to discover, it is a worthy endeavor all the same. But just as we cannot extrapolate "ourselves" from any of our experiences in life in order to have the view from nowhere, so we cannot get out of our own interpretive skin when gazing at paintings in an art museum or in reading a novel or the newspaper or in studying the Scripture, or in reading the U.S. Constitution in order to give an interpretation that is... well... free from interpretation. This is not to suggest that all interpretation are created equal, that one reading of a text is just as valid as another. We don't live life in that way, treating the interpretation of STOP signs as up to each individual driver, and neither should we employ such a "relative" hermeneutic. But we must understand that when we engage in interpretation we engage ourselves, who we are in all of our experience. Focus does indeed determine reality, but it is a good thing to question whether we have focused on the right things when we engage in the hermeneutical endeavor. The interpreter cannot extrapolate herself from reality, but she must also understand that reality is larger than her own context. In hermeneutics it is about the interpreter, but it is also about so much more... and there is no objective, neutral understanding of anything. There are, however, good and bad understandings, interpretations, and that's what we need to seek after, not non-existent objectivity. The only objective people on earth are buried in the cemetery.